Ran out to get a hair cut yesterday and decided I needed a little color too, so voilà: Purple highlights! Thanks, Joy. She’s so good that she matched the color to the jacket I was wearing. We had a short night at Albacon — one panel for me on writing flash fiction. True to form, we cut the panel short (hee hee!). But I sold two copies of Jane Quiet at the end of it (slight upward blip in whuffie), so whoo hoo! We had some tasty ice cream at the ice cream social, but having both slept badly the night before, we went home early and watched the news before collapsing. More today at Albacon — should be fun. There’s free wireless in the hotel, so updates to Facebook likely. The corset did its job: despite being on my feet all day and driving (a stick) for the first time in a month, there was very little swelling around the ankle. Yay! I even managed to find something to Sanrio-fy it, so that’s good. I have put three aside for you. I suppose we’ll either send them off — or think about coming to CT for Halloween. Hmm. Dunno!They will be awesomely signed! One for you and the other two without names, I guess?Next time you should come up for Albacon. We need more snarky folks there. You don’t have to be “old” to wear purple!! 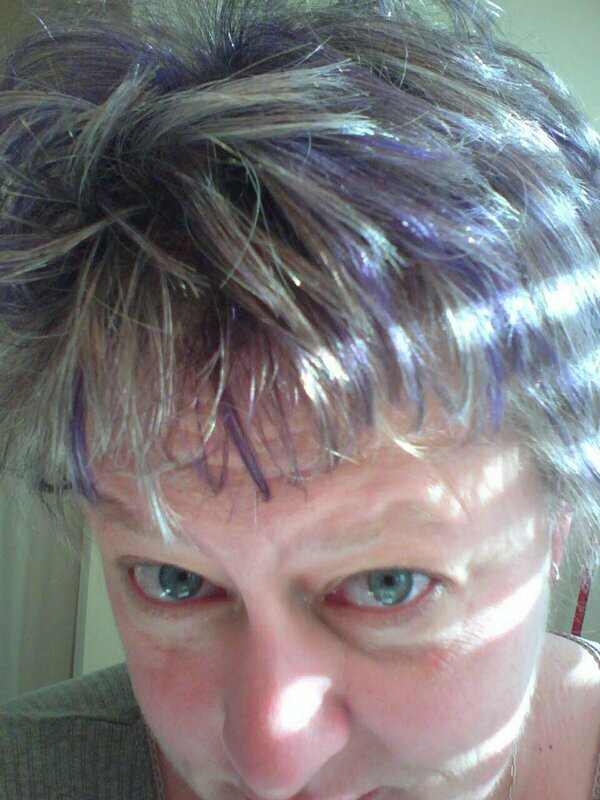 Har har — the funny thing is that the 20-something who does my hair, Joy, said quite innocently that she thought it was great that I wanted the purple highlights and it shouldn’t just be young people who do fun things with their hair. So, the subtext was “you ARE old”!